We provide dedicated whale watching trips out of Reen Pier, near Union Hall, West Cork, subject to weather conditions (and demand November-March). Our trips are a minimum of 4 hours duration, often longer. 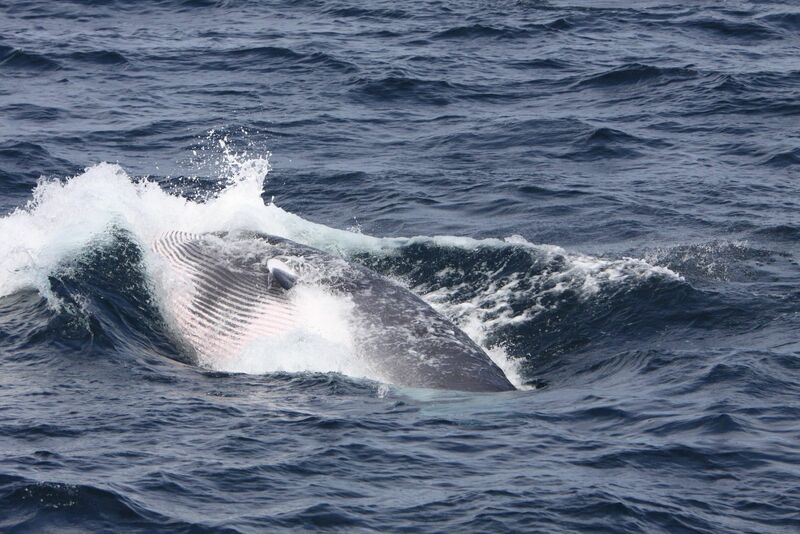 Whale Watching in the North Atlantic is weather dependent and we can’t run trips every day. Please check our Availability Calendar to see when our next trip with spaces is heading out. When you find a suitable date/time, you can contact us on this enquiry form below for comprehensive details on upcoming trips, or Phone us on 00 353 (0)86 3850568. All bookings are “provisional” until re-confirmed by you 2 days before sailing. Your re-confirmation is essential, so we can confirm weather suitability. If you do not re-confirm, we may offer your places to others on a wait list. If you send us an online booking or enquiry and can’t find our reply within 24 hours, please check your email’s spam folder or junk box. All online enquiries receive a prompt and comprehensive reply. We have a 24 hr cancellation policy. If you cancel giving us less than 24 Hrs notice, or decide not to take up your booking at the last moment, we expect you to pay in full (or in part) for the place(s) you have blocked for others. The summer schedule runs from 1 April to 30 October inclusive. The winter schedule runs from 01 November to 31 March inclusive. Book your West Cork Whale Watch Trip Now…..
To find out more about our upcoming trips, or to book your places, we suggest you use our booking/enquiry form below. You can also message us on Facebook or call us. Is this a firm booking or just an enquiry? Where will you be travelling from on the day of your trip to get to us? NB: Colin accepts payment for trips on board at the end of the voyage. There are no credit card processing facilities on the MV Holly Jo, so please be ready to pay Colin by cash after your trip. We can invoice larger groups on request, particularly for educational trips, film and research projects. Sometimes, for whatever reason, passengers may have to cancel their trip. Please ensure that you contact us at the earliest opportunity if you find you cannot keep your booking, as during busy months we may be able to offer your place to someone else. But we do have a standard 24 hr cancellation policy. If you cancel giving us less than 24 Hrs notice, or decide not to take up your booking at the last moment without good reason, we expect you to pay in full (or in part) for the place(s) you have blocked from others. We operate trips based on the most reliable weather forecasts available, and it’s rare that confirmed trips need to be cancelled. However, your safety and comfort is our priority, so if sea conditions turn out to be unsafe or unsuitable, we reserve the right to cancel any trips and we’ll make every effort to let you know in advance. But the onus is on you to keep informed of any pending weather situation which may impact on your trip, and the best way of doing this is via our daily Facebook updates, or by re-confirming your booking with us 2 days before your trip. It is essential that the contact details you give with your booking are correct at the time of sailing so that we can let you know of any changes as they occur. “Reen Pier is 4 kilometres outside the village of Union Hall, West Cork. 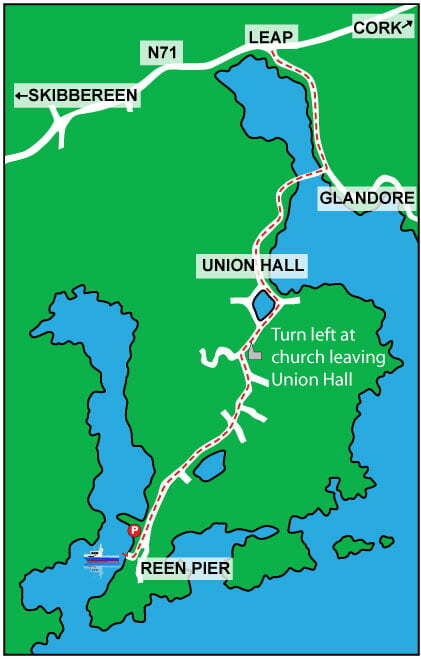 From Clonakilty, Leap or Glandore direction, go into Union Hall village and drive through the main street until you reach a large church on your left (heading away from village). Take a left turn at St. Bridget’s church; Reen Pier is signed at this point. Take 1st right after 300 metres (again signed for Reen Pier) and stay on this road, keeping the lake on your left, and you can’t miss Reen Pier. It’s a 4-5 minute drive from Union Hall to our car parking area. With beautiful Castlehaven Bay on your right hand side, the car parking area is marked by a “Cork Whale Watch” sign, and is about 200 mts before the pier itself; here you will find plenty of free car parking. Once parked, you should continue to walk the final 200 mts along the road to the pier where the Holly Jo will be waiting for you. We’d ask that you do not park on the pier itself, as it may obstruct commercial vehicles and you risk having your vehicle removed. If you are traveling from the Skibbereen or Castletownshend direction, the church is on your right side, before you get into the main village, and take a right at the church, and follow the signs as above. VERY IMPORTANT: WE SUGGEST YOU ARRIVE AT REEN PIER WITH AT LEAST TEN MINUTES BEFORE DEPARTURE TIME. Public transport to Reen Pier is NOT available from the Irish bus service provider, Bus Eireann and taxis are not reliable. So if you don’t have a car, you should be prepared to hitch hike from Union Hall village or arrange a lift with your local accommodation provider. Even on the finest day, as the ‘Holly Jo’ picks up speed, the breeze can be surprisingly chilly. Please ensure you bring a windproof/waterproof jacket for protection and sturdy footwear. We also suggest you apply sun block and bring a broad brimmed hat if your skin is sensitive to sun. Although tea and coffee can be made, we suggest you bring snacks or a picnic as fresh sea air can make you very peckish. Also important to keep hydrated by drinking plenty of fluids during the 4 hour+ trip. Our trips are a min. of 4 hours duration, all of which is spent searching for wildlife. So no gimmicks, like dropping you off on an island for refreshments during your trip! We do not recommend our trips for children younger than 5 (especially in Winter), although the final decision rests with parents/guardians.